So we often keep getting requests to share healthy snack recipes for kids. 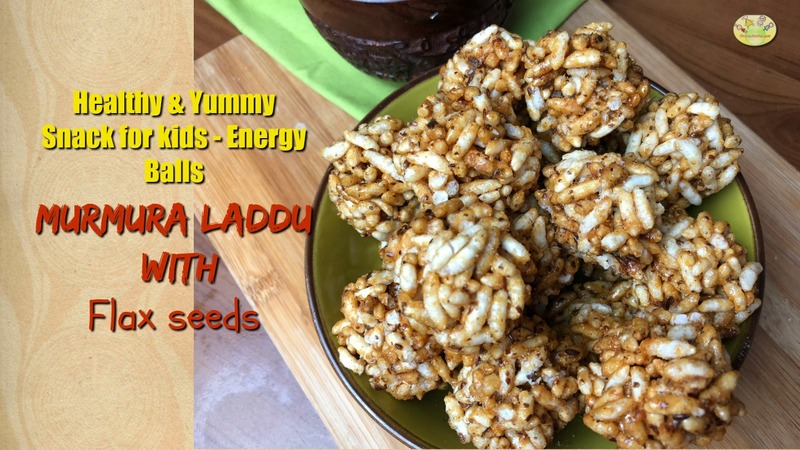 I recently made these yummy and healthy murmura or puffed rice laddoos for my daughter and she absolutely loved them. So, of course I had to share it with you guys through this blog. Murmura also known as muri or lai in different parts of India is nothing but puffed rice, which is a very common snack in most households in India. It is eaten in various forms and these laddus are also very common. However, we have tweaked it a little bit to make it yummier and more nutritious. This laddoo uses jaggery which is a good alternative to sugar, as it is not refined. When you are choosing jaggery for this recipe, make sure that you choose good quality jaggery with no impurities. This laddu works great as a quick breakfast or an evening snack for kids. It is also good to have as an after workout snack too along with a fruit for some quick energy. Grate the jaggery and keep it ready. Roast puffed rice in a pan to make sure it is crisp and crunchy again. Crush the cardamom pod to a powder. Take it off the heat and place it in a plate and allow it to cool. Add grated jaggery to ghee with a couple of spoons of water and allow it to melt completely. When jaggery melts, turn off the heat. Quickly add roasted puffed rice and mix well. Add flax seeds powder and cardamom powder to this mixture. The laddoos have to be prepared while the mixture is still hot. Wet your hands slightly and take a handful of mixture and prepare laddoos by pressing the mixture between both hands. Prepare all the laddoos in the same manner. If towards the end, the mixture starts hardening and is difficult to form balls, then heat the mixture slightly. This will loosen the mixture and you will be able to make the laddoos again. Do see our detailed video recipe below. You can easily store these laddoos for 2-3 weeks in an air-tight container. After you make the laddoos, let them stay in air for 2-3 hours so that they become crisp. After 2-3 hours, store them in a clean, dry container. This is one of those recipes that we make for festivities! So easy to make and delish and healthy because it has Jaggery instead of sugar!